Recently with McAfee antivirus since 20/03/19 I have noticed thousands of incoming blocked connections and I have no clue whether to be concerned. I mean, the firewall is working but what has triggered these connections. Also, I have run a full scan with McAfee and Malwarebytes and no threats are detected. 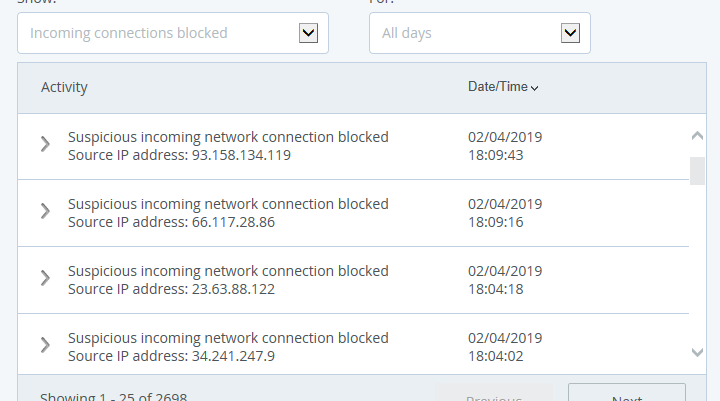 2698 connections blocked in past 12 days. They are also coming from around the world, including the netherlands, russia, us and singapore. first ip bulgaria second from adobe third geolocalisation and fourth is amazon ireland goole the ip you find wherethey lead to and remove geolocalisatioon from you system . Question What ports should I block or leave open on my PC? I have a VPN and Google security keeps blocking my logon how can I change the google security setting so allow access.